Kombucha is so much more than a drink! For thousands of years, people have been making and consuming this fermented tea for its health giving benefits. 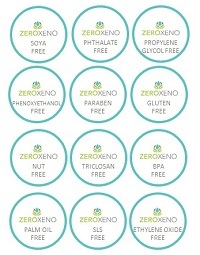 Zero Xeno believes your skin can realize Kombucha's natural properties when applied topically - nourishment from the outside in! A 2017 peer reviewed study reveals that extracts from Kombucha assist in regeneration of aging skin and recommend its use to improve age related skin conditions. Natural occurring vitamins, minerals and polyphenols in Kombucha promote may healthy skin, regulate oil gland secretion, and minimize clogged pores. Vitamins B & C found in Kombucha act as natural antioxidants on your skin which help to reduce free radicals produced by daily exposure to the elements. We ferment our Kombucha using *green,*black and *rooibos teas (*organic) for their high antioxidant and health promoting properties. Green and black tea (Camelia sinesis) are well known for their wound mending actions and researchers highly recommend the adoption of of these teas in skincare formulations because of their anti-inflammatory and anticarcinogenic value. Studies reveal rooibos polyphenols (Aspalathus linearis) are anticancerous and contain photoprotective effects against the damaging UVB rays of the sun. We use mineral rich water (activated charcoal triple filtered) so that during fermentation the inorganic minerals are transformed into organic bioavailable ones. Our natural process creates a mineral and nutrient rich powerhouse which is readily and easily absorbed by your skin to create nourishment for your body from the outside in. Kombucha naturally contains multiple organic acids, such as lactic, malic, glucuronic and usnic acids which can keep your skin vibrant and youthful. These organic acids help firm and tighten pores which may reduce the appearance of wrinkles and balance your skin's natural acid mantle. Topical application of amino acids like L-lysine and L-theanine found in Kombucha may help keep your skin vibrant, youthful and nourished. A 2016 study recently discovered components naturally contained in Kombucha have anti-fungal properties against Malassezia fungi. Malassezia species are known to cause seborrheic dermatitis, a chronic and recurrent fungal skin infection. Malassezia is resistant to common anti-fungal medication so natural sources like Kombucha have been the focus of studies to help reduce this resistance. Scientists now recommend using Kombucha as a complementary medicine for the treatment of topical skin infections, caused by the Malassezia fungi. Kombucha tea is also believed to have potential antimicrobial properties. A second 2016 peer reviewed study show that "Kombucha can be used as a potent antibacterial agent against entero-pathogenic bacterial infections, which mainly is attributed to its polyphenolic content." This ground breaking study discovered extracts taken from Kombucha were effective against various Gram-negative bacteria including Escherichia coli, Vibrio cholerae, Shigella flexneri and Salmonella typhimurium. We use Kombucha in our hair care products to help regulate your scalp's oil gland secretion by balancing your acid mantle. Naturally occurring organic acids in Kombucha will provide your hair with vibrant shine and extra body.